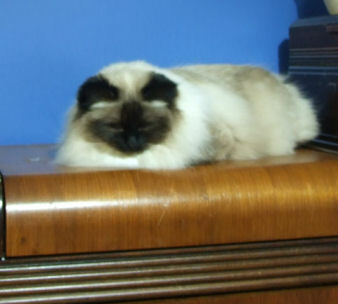 Ebony is now 5 years old, is the grandmother of Whisky's kittens. She and Whisky, like many mothers and daughters don't really see eye to eye. She is however a great buddy to Winter, my lilac girl. Ebony generally gets along very well with all the cats--Whisky just doesn't like her. 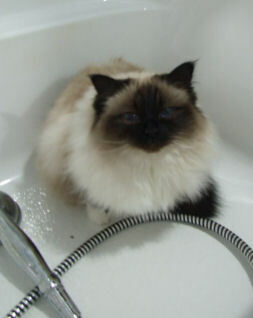 Like most Birmans, Ebony is very playful and loves being with her people. She can be a bit shy until she gets to know you though. I find her to be very entertaining. She is a bit of a talker, coming over while I am watching TV and chatting about her day. She is always available to assist when I am on the computer and she will lead me to her favorite perch so that I can pet her. I would like to see Ebony in a home with another easy going cat, or possibly with one of our kittens. She is one of those cats who seems to need the company of another feline.